We’ve moved in! 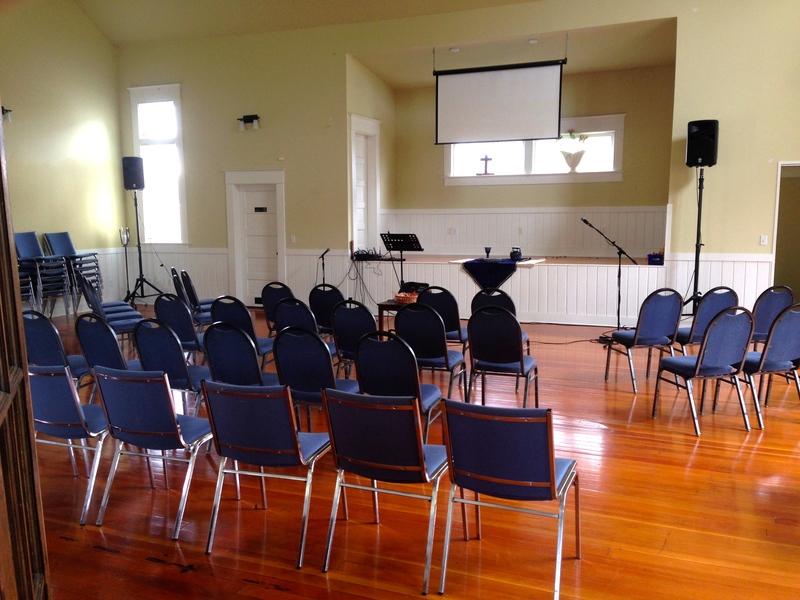 June 7 we had our first worship service in our new building. Mountain View Presbyterian sent a worship team to help us launch. Having a violin in the building really makes the music soar! I haven’t posted for awhile because it has been a lot of work getting everything set up and ready. Currently we only have an occupancy rating of 49, but after we make some more changes to the doors and exit signs we can increase that to around 180. There is still a lot of work left to do. Like any church that owns a building, we will probably have an endless list of projects that need to be done, but we are pushing forward. Our guiding goal is to be good stewards and leverage what God has given us to bless the community. We already have a couple of community groups lined up to use our space for some events and we hope to continue in this direction. We are beginning to make some good connections with neighbors and look forward to getting to know our neighborhood better. It is a lively and fun part of town to be in! 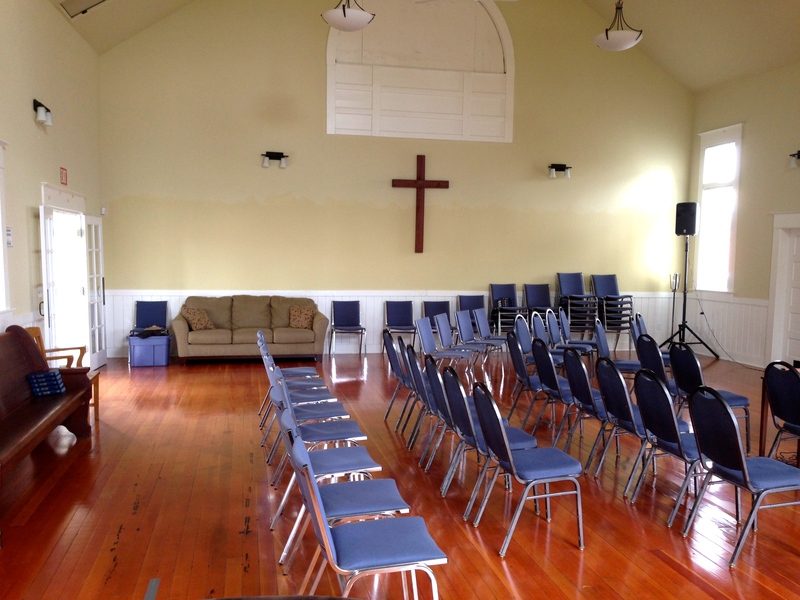 Our biggest concern about purchasing a building was that it might end up being a distraction from our goal of building a congregation of missional communities. Yet even with all of the time, work, and expense of moving through the purchase process and moving into the building, we continue to see positive movement with our missional communities. Perhaps the biggest change has been that we are now hosting a small, informal worship gathering in the Senior Center at 10:30 AM on Tuesdays. 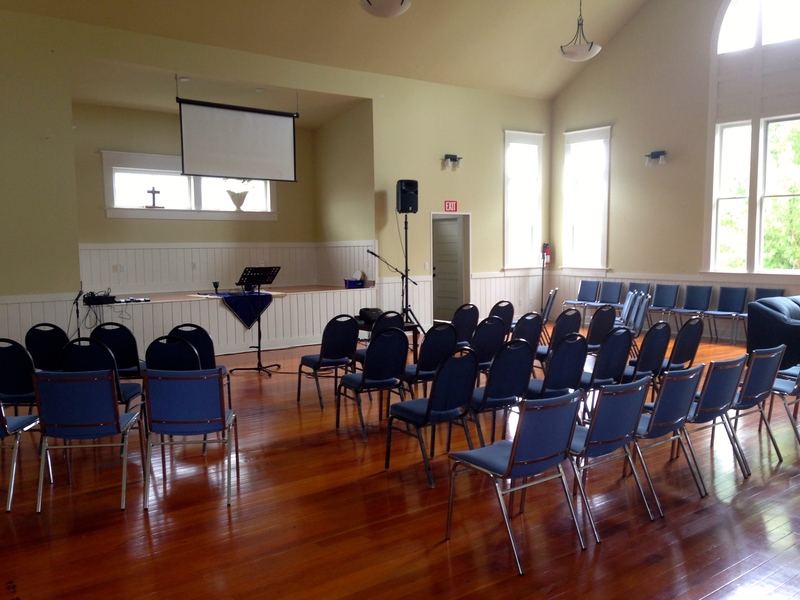 Our goal is to provide worship for those that are not able to travel to come to worship on Sunday morning. We also want to continue with the relationships that we have established there and hopefully build new ones. It is going to take some flexibility and creative thinking to establish a missional community around those that live at the Senior Center, but this seems to be a step in the right direction. I’ve posted some pictures of how we have arranged the building currently. Adjustments and some new equipment will be necessary to make it all come together for our needs. Our biggest challenge at the moment is that the acoustics of the building create a lot of bounce and echo. As nice as it would be to hire an acoustical engineer, we are going to have to try out some more creative solutions. Having chairs and some soft couches in the main sanctuary help somewhat, but it will obviously need more sound diffusion and/or absorption. You may also notice that we don’t have a formal office space set up. Right now the plan is to keep the building open and flexible and create a cafe-type feel where possible. Once we get some cafe-syle, bar-height tables we will have plenty of available space for myself and any volunteers to work on projects – which is all we really need at the moment. 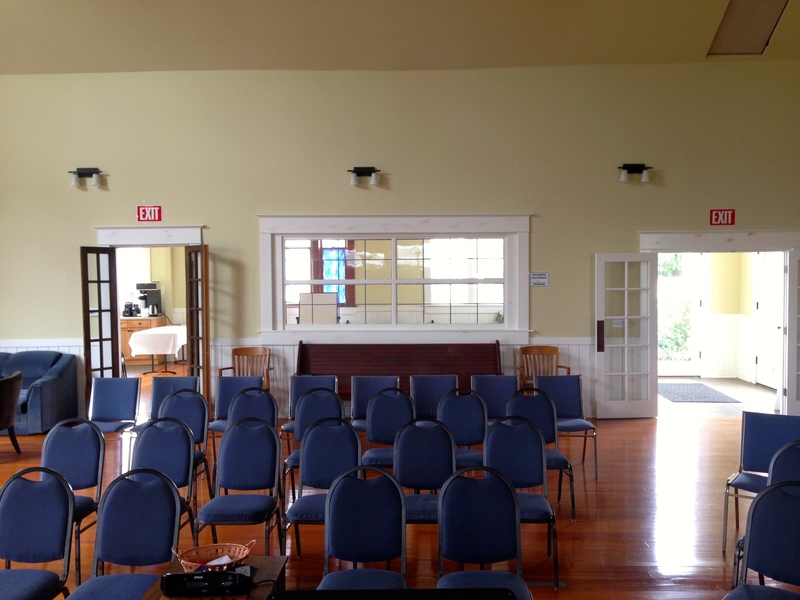 We also have plenty of available space for small or large meetings. It is wonderful not to have setup and takedown these past few Sundays. It isn’t like we had all that much to setup to start with, but it was still quite a bit of work. After 2 1/2 years of setup and takedown I almost don’t know what to do with myself on Sunday morning! It is wonderful to have a “home base” in Stanwood. I will continue to use my office at home on Camano as my “study,” but I am already spending more of my day in and around Stanwood – this has always been the goal. 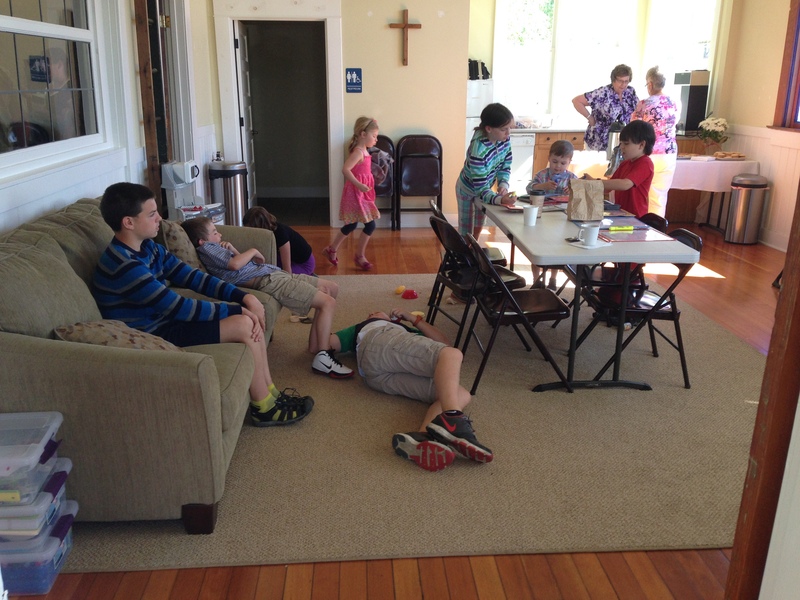 Yes, that is the pastor’s kid lying on the floor! This entry was posted in Uncategorized by Brandon. Bookmark the permalink.